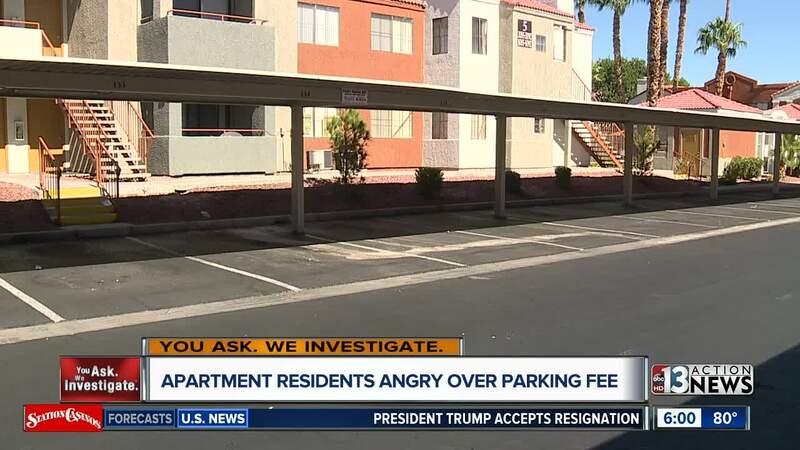 It can be a touchy subject for many Las Vegas locals -- paying for parking that used to be free -- and at one east Las Vegas apartment complex, some residents are paying $300 per year to park. That is, if you want a covered carport and not fight visitors for uncovered parking. Delia Rodriguez said the abrupt change came by way of an e-mail notice sent to residents at the Stonegate Apartment complex near Sahara and Nellis Boulevard last month. "The parking was, first come first serve in the beginning, when I moved in," said Rodriguez. "Anyone could park anywhere they wanted to," added Rodriguez. 13 Action News obtained the e-mail sent by Pinnacle , the operator for the complex, which stated any covered carport parking spot would now come with a $25 dollar per month fee. Any uncovered spot would remain free and unassigned. The new charge, some residents say, created a major parking problem. "You are putting my car into jeopardy because you want to charge me $25 a month, that is just not [logical,] added Rodriguez. Rodriguez says residents who do not want to pay the additional fee and are unable to find available uncovered parking are forced to park onto the busy road in front of the complex. "We are paying rent every month, and parking should be included," said Ursula Versellie. "I feel they are bullying people to pay for parking," added Versellie. Versellie worries for her adult daughter and others who are struggling to make ends meet but also for their safety. "She works in a call center, supports herself and goes to school at night and $25 a month is just nuts," said Versellie. 13 Action News called 20 Pinnacle-run properties in the Las Vegas and Henderson area and only 1 property charged a $10 per month fee for covered carport parking.